The Falcon leak test system. THE Falcon leak test system from Cincinnati Test Systems simultaneously determines leak location and total leak rate, providing real-time process control. Available from MPW Australia , the system delivers exceptional performance, communication and control benefits that significantly enhance leak detection efficiency and effectiveness, as well as eliminating the need for additional leak tests. The Falcon leak test system provides a cost-effective solution that bridges the gap between traditional pressure decay technology and helium vacuum mass spectrometry. 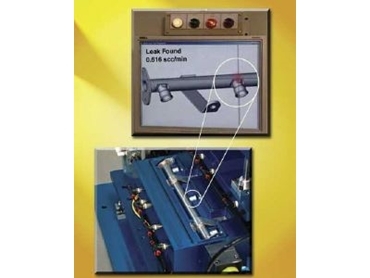 Its advanced, on-screen graphics display provides precise visual recognition of the leak location and accurately identifies the leak rate for the operator. It also communicates the information to designated factory communication networks, ensuring the quick resolution of manufacturing deficiencies to avoid downtime and production line back-up. The system interfaces with a matrix of strategically integrated Intelense sensors. In-probe microprocessors initiate data processing while advanced software manages the signals from the multiple sensors. The system also features on-board diagnostics that maintain system vitals.